Wondering what happened to me all of sudden, that I am not being regular? Well I think it has to happen sometime right. I was so totally unprepared for the summer vacation and it hit me unaware. First was my nephew and niece coming over and then kids being at home, simply catches up with you and you are left with no interest to do anything! When school is on, you are pressed with hectic school schedule. When school is closed, you are faced with late nights and sleep induced hangovers the next day. See this happening over couple of days and your entire routine goes for a toss. Anyway I am slowly getting back to my schedule and seeing all the pending work, really scares me. On top my buddies make sure I am always on my toes, what with them wanting to plan ahead for the next Mega BMs. In a way they keep my sanity or is it vanity? anyway that ensures I am always thinking of themes, ideas and what else to do! Coming to the post for today, it’s a simple poriyal made with Banana Blossoms. We love Masala Vada with Banana Blossoms, and I came to know about other ways to cook this delicious, was when I was doing the Regional Mega BM and went through Assamese Koldil Bhaaji / Dry Banana Flower Sabji. That was the first time I ever realized there are ways to enjoy these flowers, other than our masala vadais. Not that we would ever give up loving the vadas, still its nice to know other ways. Ever since I made that poriyal, I knew there must be some equivalent and I was right. I came to know about this from my colleague who said they too make it as dry poriyal. That naturally led to Kerala style thoran. 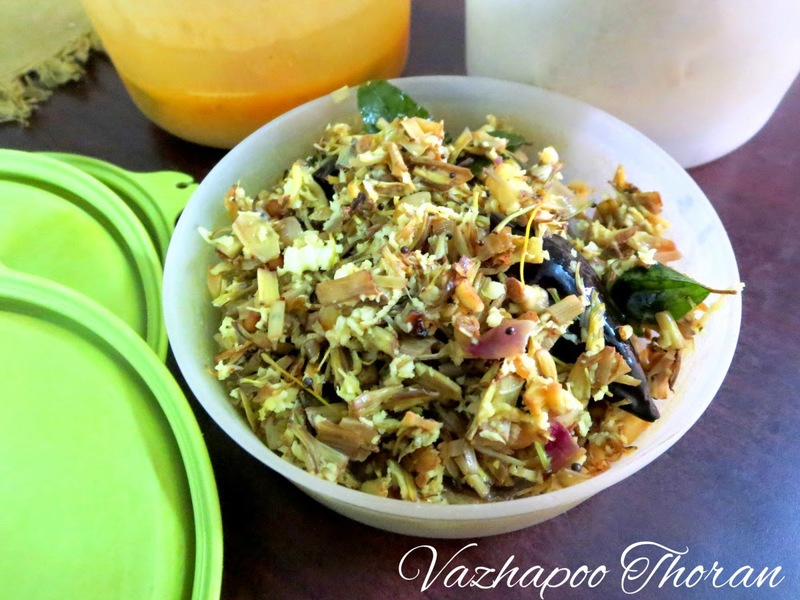 Today’s recipe is adapted from what I heard and I can’t really say if it Tamilian or Kerala. However its something that you will love for sure! I am sharing my lunch boxes with you and I know it doesn’t look much appealing. Life sometime gives you dry suzji, rotis and a thin dal, one has to get used to it. Especially when you are on eternal diet that advocates more than what you can consume amount of veggies, dals and no carbs, gosh life becomes so gray! Wash and clean as shown in the post. Chop it finely and keep it in water till you are ready to cook. Drain and squeeze the chopped blossoms. Add to the pan and combine everything well. Add salt and adjust spice. Simmer and cover with lid, cook for 10 mins. Finally add grated coconut and switch off. This goes for the May Week 4, Cooking from Cookbook Challenge Group. 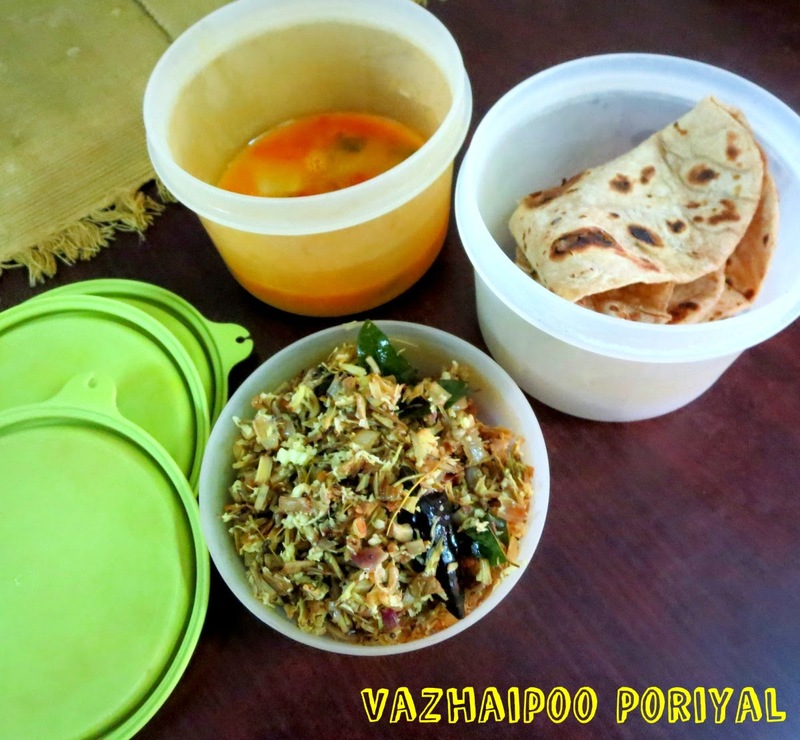 Apart from paruppu usli, we make this dry curry too ! looks tempting! I'm yet to try banana blossom, though I've seen at the Indian store, never bought it because I don't know how to work with it. Will definitely have to try it out some time. Poriyal sounds so simple and delicious.